Antifascists patrolled the streets of Athens in large numbers once again on Thursday evening. 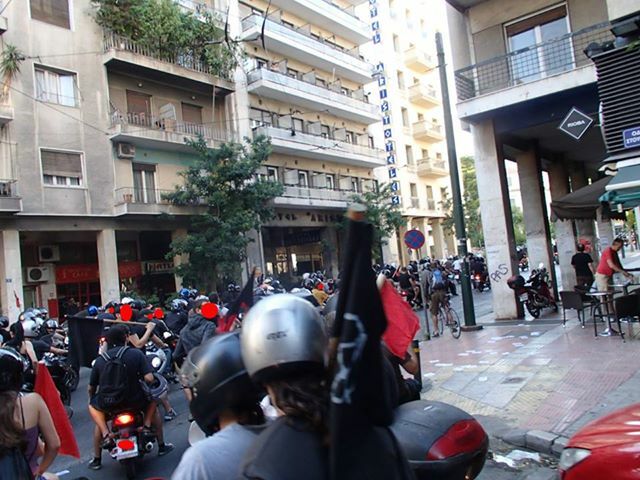 Hundreds of people on around 150 motorbikes carried out another antifascist patrol in Athens on Thursday. The patrol started in the central Exarchia neighbourhood and went through the centre and north of Athens before returning to Exarchia without incident. The video and images in the link below show the beginning of the patrol as people move off under red and black flags whilst chanting antifacist slogans. This was the fifth large scale patrol organised in Athens. Numerous over patrols are regularly conducted around the country and in other areas of the capital such as Petralona. Previous groups have been attacked by police as was the case with the patrol in September last year which led to the arrest and torture of several participants. The neighbourhoods Thursday's patrol passed through are home to a large non-Greek population but are also areas of increasing fascist activity. In May a man was arrested for an attack on a non-Greek owned business. The 34 year-old, with possible links to Golden Dawn, admitted that he was part of a 'citizens patrol' which was active each night in this area. Nah, it was me the embedded the video.. it went all weird but I figured it was better like that than not at all.. nice one for sorting it out though (and obv cheers to Thrasybulus for the write up!).. Thanks for sorting out the video, I couldn't see how to do it myself.